Loss of hearing is something that affects many thousands of people. The degree of loss may be very small or it can be severe, even total. The causes of hearing loss are vast and each disorder will affect individuals differently, some losing hearing very slowly, others very quickly and acutely. For those who suffer from a very gradual loss of hearing, it may go unnoticed by the individual as they slowly adapt to the loss, often totally unaware that they are losing their hearing. It is often the friends and family of the person who notice the loss and feel they should bring it to the individual’s attention. This can be a difficult subject to approach, and one that does not receive a grateful welcome. It is however, necessary to try and inform the sufferer as they may be unable to doorbells, alarms (including smoke alarms), and may even be unaware that they are upsetting neighbours with high volumes of the television or radio. The most obvious sign that someone is losing their hearing is because they ask you to repeat conversations, words or sentences. Constantly saying ‘pardon?’ or the like, may indicate that something is wrong.Having the television louder than normal or so loud that it becomes a nuisance to others is also an indicator.It may be that the person seems more forgetful than normal, not turning up for meeting or appointments, but this may because they have not heard the conversation in which these terms and dates were discussed. If the person is aware that they have loss of hearing, they may become withdrawn from society, and stop engaging in conversations as they feel frustrated. Looking directly into the face of the person who is talking to them, asking them to ‘speak up’ or stop mumbling are also giveaway signs.It is often the case that the person will not want to admit they have a problem, or may think that you are joking when you mention it, especially if it is dropped into normal conversation, or said with sarcasm or humour. 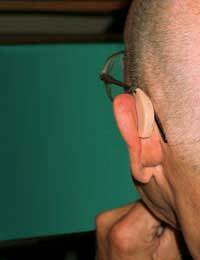 Firstly, you must understand how frustrating it can be for the person with the deafness. As much as it can be annoying having to repeat everything you say to them, imagine how they feel having to keep asking, or getting the wrong end of the stick because they have misunderstood or misinterpreted something they think they have heard. Most people respond well to gentle honesty. Mention your concerns when you are in a private place away from other people, in a familiar environment. Reassure the person that although they may be losing their hearing, that it may be reversible or extremely easily treated.If they are not very responsive to the subject, mention some examples of times when you have noticed they haven’t heard you. Don’t cite other people’s comments, or even declare that other people have been talking about it, simply state your examples without causing embarrassment for them.Offer to make an appointment at the doctors for them, and offer to accompany them.Being a good listener to any fears they may have will be extremely valuable to the person. Deafness and hearing loss are issues that affect not just the sufferer, but those living with and around them. There are a great many hearing devices available for use, many of them extremely inconspicuous and a lot less expensive than in previous years. Being a supportive friend or family member will help the person come to terms with their loss and adjust and adapt their lives accordingly.